BSRIA document BG50/2013 ‘Water Treatment for closed heating and cooling systems’ states that ‘chemical dosing pots should remain open to the system with a continuous through flow of water’ viagra kaufen per nachnahme. The reason for this is to prevent the dosing pot becoming a deadleg and therefore a potential area for bacteriological contamination/corrosion. 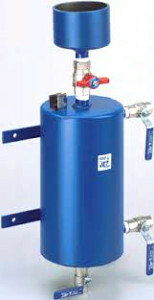 Generally dosing pots are fitted with lever valves. We recommend that these are just ‘cracked open’ so as to allow a degree of flow without starving the rest of the system of any water. Designers should now consider installing commissioning stations on dosing pot pipework and making a provision within their calculations as far as design flow rates are concerned.